Around the Common: Law Offices of Daniel F. Clifford, Jr.
Around the Common would like to welcome the Law Offices of Daniel F. Clifford, Jr. as our newest local business listing. We encourage you to always support local businesses first! Over the past 20 years, the Law Offices of Daniel F. Clifford, Jr. has proudly represented hundreds of employees and individuals injured in the scope of their employment and individuals harmed through the fault of someone else. They concentrate in the areas of workers compensation, personal injury, and social security law. In doing so, they not only look to maximize the monetary recovery for their injured clients, but work to reduce problems that clients endure as a result of being injured. It is important to the firm's client-centered philosophy to look at the whole picture. As part of the efforts to provide quality representation for their clients, the Law Offices of Daniel F. Clifford, Jr. fully prepares cases by hiring quality medical and vocational experts, as well as economists, accident reconstruction experts and safety engineers. It is only through such preparation and investment that they are able achieve a fair and just result for clients. 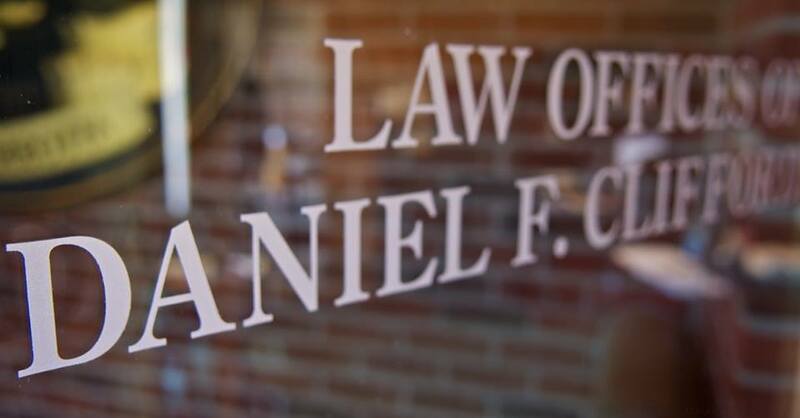 Located at 20 Scotland Boulevard in Bridgewater, the Law Offices of Daniel F. Clifford, Jr. prides themselves on providing quality legal representation to local clients and is available for a consultation on any case where someone has been injured due to the negligence of another person. For more information about the Law Offices of Daniel F. Clifford, Jr. please visit their website by clicking here. You can also "Like" the firm on Facebook by clicking here.